A brand new series of board books featuring DC Comics' Greatest Super Heroes, Batman and Superman! Illustrated by award-winning artist Ethan Beavers in the popular DC Animated Style, these heroic tales will introduce young children to important and buzz-worthy character education concepts, including Courage, Respect, Honesty, and Responsibility. 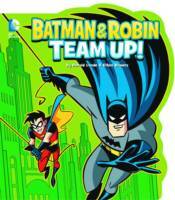 Follow Batman and Robin on this fun, action-packed adventure about working together! Batman and Robin Team Up! introduces young children to the character education concept of respect, while appealing to comic book fans of all ages.